Well, happy World Card Making Day to ya'll!! Isn't every day in the life of a papercrafter World Card Making Day? Yep, if you didn't know there was such a thing, you can read all about it HERE on the World Card Making Day website sponsored by Paper Crafts magazine. Speaking of which, did ya'll see? Did ya'll see? I'm in the latest issue (Nov/Dec)! 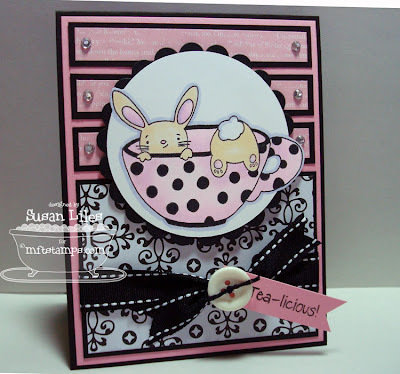 I won two categories in the Stamping Royalty Contest! I'm super thrilled and I even have another card featured as an online bonus project HERE. How fun is that!?! We're not having too much fun here in the Liles household today, as we are having some plumbing problems. Nothing fun like backed up toilets or the like, just a bunch of leaky faucets and showers that are causing our water bill to spike and it's just time to get 'em fixed. So I have been trying to get my card for today done this morning (I shouldn't wait so long, I know) in between playing "go-fer" for Eric and his dad who came over to lend a hand and being the "finder of lost things" for the girls. After I get this written up, I've got to take them to McDonald's or somewhere to potty since the water will be turned off for quite a while! (TMI? Sorry!) Lindsie called it "training for Disneyworld", since they may have to "hold it" until we find a bathroom when we are in the parks! What a trooper. Anyway, a little later today (like around 6pm I think), My Favorite Things will be participating in World Card Making Day by hosting a challenge on Splitcoast. HERE is a little info on that. You want to play because there will be cool prizes up for grabs. I'm not going to reveal the MFT challenge to ya'll just yet, but just consider this card as a little hint, although you don't know how big or small said hint is!! I decided to combine it today with Jen's Sketch For You To Try, our Saturday staple! I used a long time favorite MFT set of mine called Tea for Two. I also used the "out of the box" technique again, but this time with a circle. Nestabilities won't work for this, but if you have any other "manual" circle cutting system (like the one from Creative Memories), you can accomplish this easily by just cutting the portions of the circle that don't have anything "sticking out" of it. Then you just cut the remainder by hand. Ok, the girls are about to pop, so I better make a bee-line for a bathroom for their sake before I have another mess to clean up. However, before you "go", be sure and pop on over to my other favorite Sketch for You To Try girls' blogs for some more inspiration! See anyone new? YES!!! Carole has decided to step down from the SFYTT challenge, so we have a new sister on board--LEIGH O'BRIEN is in da house!! I'm not sure if she'll be playing today, but just in case you want to check out her funky style, I'm including her in my list this week. Also, you'll want to check out Jen's blog of course to see the sketch so you can all play along, but it's the first of the month and we have a new Guest Designer, Loralie Kim!! SUSIE Q-TIP: I will not wait until Saturday morning to make my SFYTT card. I will not wait until Saturday morning to make my SFYTT card. I will not wait until Saturday morning to make my SFYTT card. Oh this is sooooo cute!! Just love the color combo you used! Congrats on the Paper Crafts publishing! I don't have the latest issue, so you will have to post them on your blog when you are able! I actually managed to get a card published in the upcoming Mar/Apr issue...very exciting! Hope your pottys are on the mend soon! Hi there! And Happy World Card Making Day! Just thought I would swing by and see what you were creating this weekend! Have a good one! Oh Susan, I love that little fella! Thx for sharing! this is FABULOUS! love the pink and black combo!! sorry about the plumbing! This is too stinkin' cute!!! Ooooooooo ... LOVE this, Susan! The image works perfectly with the sketch! Love the out-of-box look! Ive been into card making lately. Thanks for the ideas!